Steve latest newsletter summarizes some of his book and gives good insights — especially in this 500th Anniversary of the Protestant Revolt. “The Protestant understanding of justification is a legal one. God is viewed as a merciful judge before whom the sinner stands guilty. The judge declares the sinner, “Not guilty.” Although there’s no inward change in the person, the great gift of no more condemnation is received by faith. While Catholics don’t deny that there’s a forensic nature to justification, they believe that there’s a more profound change that occurs in justification than just going from guilty to not guilty. In the Catholic understanding of justification, God is primarily viewed as a father. The sinful person is forgiven and restored to the family fellowship as a child of the Heavenly Father, just like the prodigal son in Luke 15. This restoration as a son of God is called adoption, which is the central truth in Catholic beliefs on justification. Divine adoption is the inconceivably merciful and gracious acceptance of those justified into the divine family and a sharing of kinship with God the Father. For the whole article like HERE. To see or buy his book, click HERE. "While Catholics don’t deny that there’s a forensic nature to justification, they believe that there’s a more profound change that occurs in justification than just going from guilty to not guilty." The author paints with a broad brush. The assumption that not-Catholic Christians don't hold to the same concepts in both halves of the sentence quoted above is disingenuous. STEVE RAY HERE: The author paints with a broad brush because he’s covering a wide swath of Protestantism. He is speaking in generalities which is completely proper and acceptable in the context. 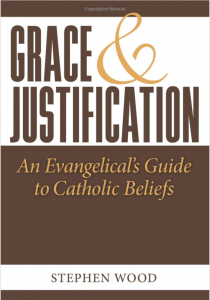 The fact that protestants do not believe as Catholics do on justification is quite clear. All one has to do is pick up the average Evangelical Protestant or liberal Protestant or any other theology and they will find that the author is correct. The word ‘protest’ has had a history something like that of the word ‘apology’. In common use, that word has evolved from a positive sense: “a formal justification or defense” as in ‘apologetics’ … to a statement of regret or request for pardon. At he time of the Diet of Speyer in 1529 The word ‘protest’ had an affirmative connotation… similar to the word ‘testament’. The appeal to Charles V affirmed that “they must protest (* make a solemn declaration) and testify publicly before God that they could do nothing contrary to His word”. + testari “testify,” from testis “witness”. The above was the accepted meaning into the Elizabethan era as well. Its accepted meaning was not “objection” … but “avowal” or “witness” or “confession” as the Latin protestari, meant also “to profess”. almost 300 yrs after the Second Diet of Speyer in1529.